Do you struggle with rosacea on your cheeks? Does it seem impossible to get rid of acne in this same area? If you're plagued by either of these problems, Traditional Chinese Medicine (TCM) might have a solution for you. TCM focuses on the interconnectivity of the body. An imbalance or issue in one part of the body often affects another seemingly unrelated part. TCM can help us become aware of connections we may have overlooked and guide us in changing the root conditions. According to TCM, the lungs are related to the cheeks. For example, if you're a smoker or if you're regularly exposed to pollution, you may experience acne breakouts or rosacea on your cheeks. 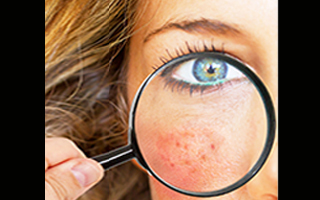 Rosacea is a chronic inflammatory skin condition characterized by redness and skin hypersensitivity. The oxidative stress your body experiences as you draw dirty air into the lungs can often show up on your face. In order to change this, you will need to better oxygenate your skin. Both topical and oral antioxidants can help prevent breakouts and calm rosacea. Studies have found that antioxidants can help repair skin damage and can even help prevent wrinkles. In addition, oral antioxidants will help further protect your skin and prevent free radical damage from pollution and the sun. CoQ10, bioflavonoids, vitamin C, green tea, turmeric, chamomile, calendula, medicinal mushrooms and chlorella are just a few antioxidants you can use internally. Chlorella is a micro-algae that's full of carotenoids, which are a category of antioxidant also found in many fruits and vegetables. Antioxidants can have remarkable effects on the intracellular signaling pathways involved in preventing skin damage. They also can be protective against photo-damage as well as the general prevention of wrinkles and inflammation. Of course, you should also apply antioxidants from the outside too in order to minimize breakouts and improve the health of your skin. Start with a good cleanser to make sure you remove any pollution that's settled into the pores. Then use a product such as the Système 41 Night Treatment; to rejuvenate and strengthen the skin. This will make it less vulnerable to future pollution exposure.